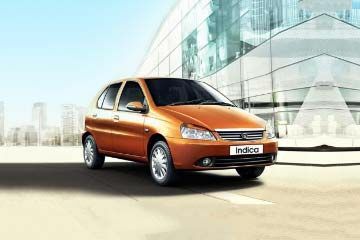 Tata Indica Offers: Tata Motors is offering discounts worth more than 50,000 over its Tata Indica eV2. Read more about it here. Tata Indica Price and Engines: Priced in the range of Rs 5.13 lakh - Rs 5.61 lakh (ex-showroom Delhi), the Indica is available in two variants - ELS and ELX. Both the variants are powered by a 1.4-litre diesel engine producing 70PS of max power and a peak torque of 140Nm, mated to a 5-speed manual transmission. The Indica eV2 returns a company claimed mileage of 25kmpl. Tata Indica Features: It gets an AC, power steering, tachometer, front and rear fog lamps, keyless entry, remote central locking, power windows, 60:40 flip-flop rear seat, and a music system with Bluetooth, USB and Aux-in connectivity. Despite its ageing design and scarce list of features, the Indica eV2 is still a favourite among tour operators courtesy its spacious interiors and low maintenance cost. Tata Indica Competition: It competes with the likes of the Maruti Swift, Maruti WagonR and Hyundai Grand i10. Tata’s first crack at India’s booming hatchback market came way back in 1998. Nearly two decades on, the humble Indica continues to soldier on carrying forward the same formula it debuted with - a spacious cabin, a frugal motor and a low sticker price. With modern offerings storming the market every month, does the Indica manage to hold its ground? Let’s find out. Should you consider buying the Indica in 2017? The answer to that, quite simply, is no. With prices starting around the Rs 5 lakh mark, there are far better looking and better equipped cars on sale today. The Indica is too dated to be in the running. That however does not take away from the fact that the humble Indica is a reliable, no non-sense workhorse. The humble Indica is a reliable, no non-sense workhorse. Spacious cabin can accommodate five occupants. Good for those family dinner trips. Fuel efficient diesel motor keeps the wallet happy. ARAI-certified efficiency = 25kmpl. Comfortable low-speed ride quality. Cabin doesn’t get put off by an odd pothole. Engine feels underpowered on the highway. Best used for intra-city commutes. No ABS or Airbags on offer, even as an option. The claimed ARAI mileage: Tata Indica V2 Diesel is 25.0 kmpl | Tata Indica V2 Petrol is 16.84 kmpl | Tata Indica V2 CNG is 23.7 km/kg. The Tata Indica eV2 is the newest addition to our long-term fleet. Since we love hatchbacks we thought we'd give the cheapest diesel car in India a shot at the city life. New products and upgrades, all are a part of Tata Motors HorizoNext plan. On the day this was announced, the company refreshed eight of its products. One of them is the coutry?s first diesel hatchback, the Indica. This hatchback has been improved continued and it has received several facelifts too.